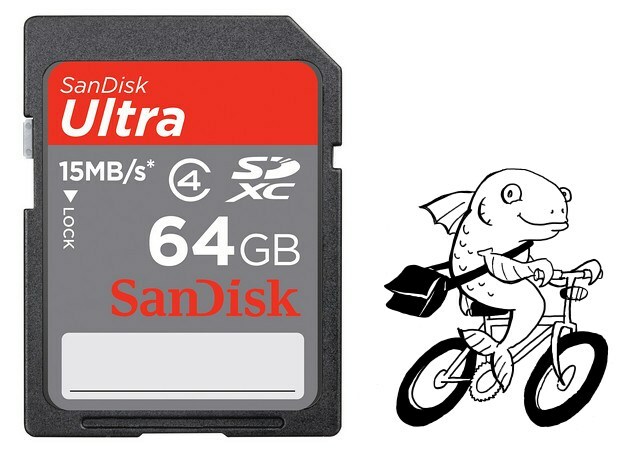 Who actually needs a 64GB SD card? The idea of having a 64GB card in your camera is a strange one. I take a fair amount of pictures in RAW, yet I rarely if ever run up against the edge of my 8GB card. I mean, you’re shooting digitally and regularly offload your pictures, right? The only situation I can think of where this might be useful is one where you literally have to shoot thousands of pictures in a row (somehow the battery must last that long) without ever switching out a card or dumping them into your image editor. When was the last time you took four thousand pictures in one go? I suppose people shooting high-definition video might find these useful. You’d have to have a bunch of them in array, though, because data throughput is pretty limited right now (the SanDisk one goes at a poky 9-15MB/s). But at $350 per card, you’re paying way more per gig than you would if you just got a 1.8″ SSD or two — and they’ve got fantastic write rates. Plus, again, you’d probably run out of battery before you ran out of space, even shooting at 4K or something. There’s really no market for these right now, unless I’m overlooking something. Not that I don’t think it’s cool — I mean, it’s totally sci-fi that I could carry around my entire music collection in the coin pocket of my jeans, but right now there’s really no reason to. Give it a year, though, and these things will be looking much more practical. Update: Ahh, I thought of one use. Storage in a small form-factor computer like a tablet. Can always use more space there. Still too expensive for that, though.